Cover and cook on low for 6 to 7 hours. Or cook on high about 4 hours. Leave the tortellini in its original package and place it in its own closable freezer bag. Also, leave the cheese in its own bag. Pour the chicken, alfredo sauce, and broth into another freezer bag. 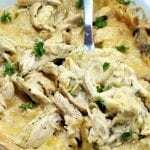 Use the "tape together" method shown in our Crock Pot Chicken Pot Pie recipe. Tape all three bags together, label and freeze for up to three months.